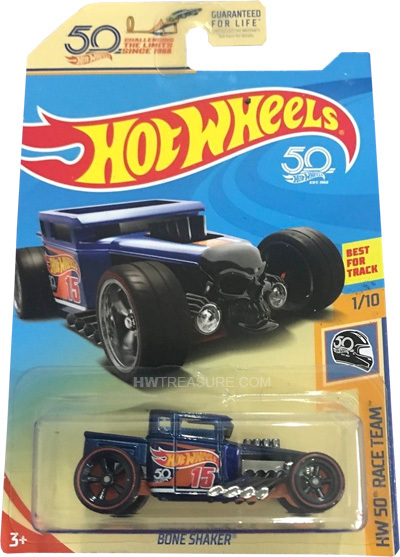 FTT37 is part of the 2018 Super Treasure Hunt set and 1/10 in the HW 50th Race Team series. It is Spectraflame blue with orange details and “Chase Ultimate” on the hood. The sides are decorated with the Hot Wheels logo, “15”, and the 50th anniversary emblem. The car has a chrome interior, black 5-spoke Real Rider wheels with redline tires, and an orange plastic Malaysia base. This is the Ultimate Chase car. A 16th vehicle added to the Super T-Hunt series that is more difficult to find than the others. 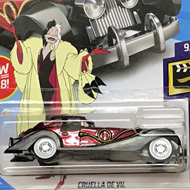 The Bone Shaker made its debut in the 2006 First Editions series. It has previously been a Treasure Hunt in 2009 and 2013.